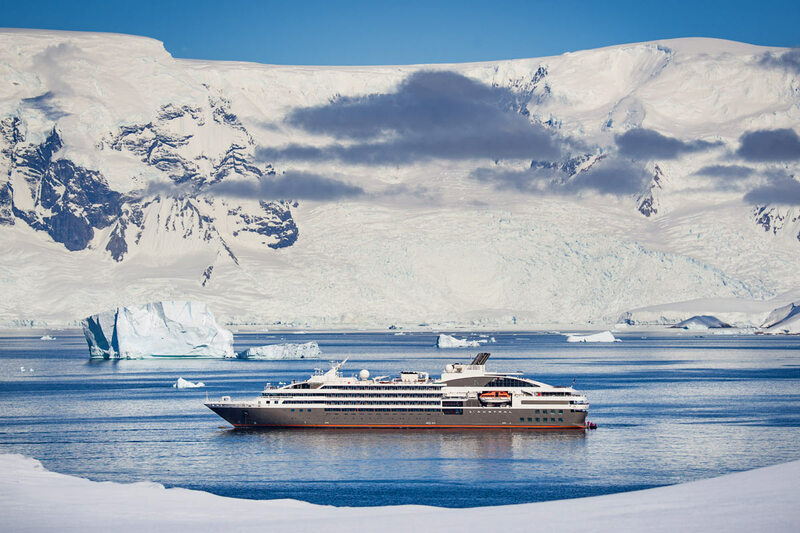 Save 10% off on 2019 and 2020 Antarctica voyages on the Greg Mortimer. Offer is valid on new bookings only which must be booked and deposited by the March 31, 2019, or until sold out, whichever comes first. Prices online do not show the discounted rates. Terms and Conditions apply, special offer is subject to availability, please contact us for more details. Enjoy a warm, late afternoon welcome from our friendly expedition team and Russian crew. You’ll have time to settle into your cabin and explore the ship before our evening departure. Excitement lifts as we lift anchor and set sail down the Beagle Channel, keeping watch for Magellanic penguins, dolphins and albatross.Please note: We recommend you arrive into Ushuaia at least one day prior to your departure start date to avoid issues with flight and luggage delays. A luggage transfer from your Ushuaia hotel to ship is included today. Ushuaia port is a short walking distance from your town; you are required to make your own way to port in time for boarding this afternoon. 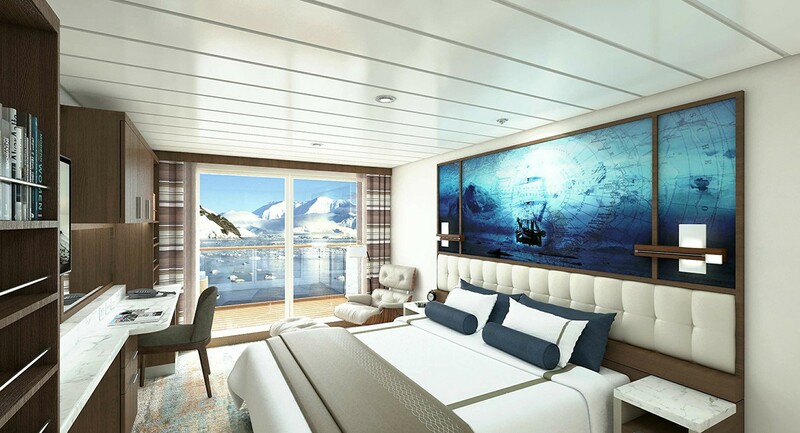 Your voyage has one night’s accommodation included prior to embarkation. Vessel Type: Expedition Length: 104 metres Passenger Capacity: 120 Built: 2018 Capable of negotiating the strongest winds and waves, the Greg Mortimer is built to world-class polar standards – designed in close consultation with our expedition specialists, taking advantage of our more than 25 years of experience. 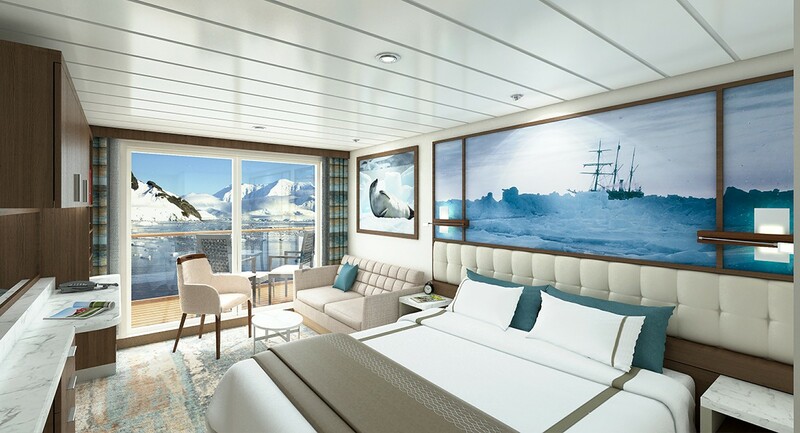 The Greg Mortimer redefines expedition cruising for the future, with just 120 passengers on board in the polar regions. Not only is the ship bigger to contend with adverse weather conditions, its added creature comforts make for a more enjoyable journey out on the open ocean. The Greg Mortimer remains true to our ethos and focus on multiple landings, flexible itineraries and family atmosphere – just with an improved home base! As a modern and custom-designed ship, the Greg Mortimer is at the cutting edge of nautical technology. Robust, powerful and built with our guests in mind, this ship marks a significant investment in our fleet's capabilities. From the European Arctic to the depths of Antarctica, and other far-flung destinations in-between, the Greg Mortimer will make your journey a breeze! Greg Mortimer X-BOWX-BOW™ Our expeditions face some of the worst Mother Nature can throw at us. However, this won't be problem on the Greg Mortimer with the introduction of the patented X-BOW™, created by Norwegian ship designer ULSTEIN. As one of the leaders in marine engineering, ULSTEIN's X-BOW™ is an inverted bow concept that's been built on over 100 vessels in the shipping industry. Excitingly, we are the first expedition cruise operator to utilise this technology for the challenging open ocean waves! Hydraulic viewing platforms Although there is no doubt that you'll love the aesthetics of the Greg Mortimer, we are all here to admire the spectacular landscape and spot the elusive wildlife in their natural habitat. To ensure you get the best views possible, the new ship features unique viewing platforms, custom-built for the Greg Mortimer. Accessed from Deck 5, the two platforms fold out hydraulically for unobstructed views of passing marine life and seabirds – make sure your camera is locked and loaded! Zodiac launching platform Zodiacs are a vital part of getting up close and personal on your adventure – sneaking into areas that the Greg Mortimer can't reach. On this new ship, there are specially designed launching platforms that enables us to load Zodiacs easily and quickly, allowing you to spend more time exploring on the two to three daily landings. There are 15 Zodiacs that are boarded from either side of Deck 3 (sea level), perfect for when there is a group of fluffy cute penguin chicks that we need a photo of! Activity Platform Regardless of your destination, we offer a number of additional activities to allow you to see more of the environment. From kayaking and diving to climbing and ski touring, it's these optional activities that often leave the biggest impression on your trip as a whole. Onboard the Greg Mortimer, there is a spacious prep and loading platform for these activities and more – designed in consultation with our expert activity guides. Environmentally friendly Climate change and carbon emissions continue to be major issues that everyone needs to be aware of and actively managing. This includes reduced emissions into the air and sea, lower energy consumption, high fuel efficiency, reduced light pollution for minimal wildlife disruption and lower on-board plastic use. It's vital to also mention the state-of-the-art virtual anchoring technology of the X-BOW™, which means the ship can float anchorless while launching Zodiacs, kayaks etc, without disturbing delicate sea floor areas. Safety features This starts with the return-to-port equipment – not compulsory on a ship of this size – which duplicates the propulsion system. This enables the ship to maintain operating systems and comfort in the event of engine failure. Furthermore, the Greg Mortimer is Polar Code 6 compliant, holds BV class and is fully compliant with the latest SOLAS requirements. It's also built with a Rolls Royce stabiliser system. If there's an incident or accident during your adventure, the ship has an on-board, fully-stocked medical centre – where our trained medical team can provide necessary treatment in a timely fashion. Safety continues to be an issue that our team takes very serious and the Greg Mortimer allows us to create an environment where you can concentrate on the brilliant landscape and wildlife, without worrying about your wellbeing. Ship Life Greg Mortimer is designed to serve your every need. It's your bedroom, bathroom, lounge, dining room and even your observatory. Make yourself at home, the Greg Mortimer is yours to enjoy! Observation Points Let's face it – you don't want windowless rooms when travelling around some of the most beautiful locations around the world. This is why the Greg Mortimer is designed with plenty of dedicated observation spaces – ideal for keen bird spotters, wildlife watchers and those wanting to watch the scenery go past. From the indoor 180-degree lounge and outdoor 360-degree open deck, both on deck 8, to the 270-degree open sundeck on level 7, there are plenty of observation points to share around the ship! If these are full, then you can take up a spot on one of the two hydraulic viewing platforms on deck 5. 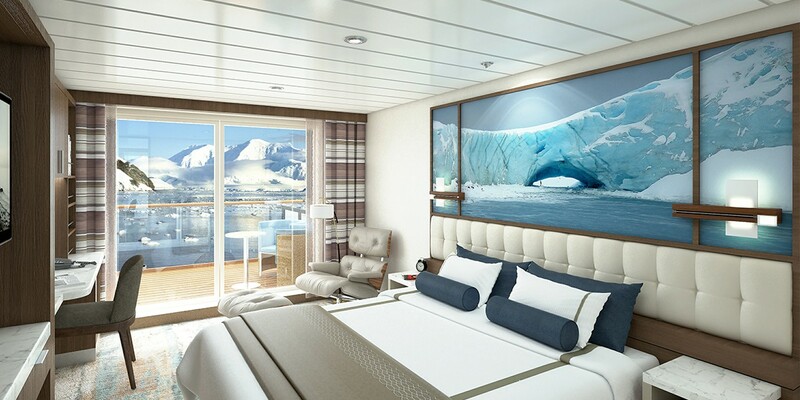 Aurora Expeditions also has an open bridge policy, which means at any point you can come up to the bridge and check out what the captain and officers are up to. From watching navigational practices to observing mapping techniques, you can get a firsthand look at the inner workings of the Greg Mortimer. Shore excursions Although the ship is fun, the real enjoyment comes from the many shore excursions that are available. Depending on the weather and itinerary, it's possible to take two to three landings daily, taking a look at everything from rock formations and ancient ruins to cute groups of penguins. We know time is of the essence in these wild locations, so the Greg Mortimer has been designed with 15 Zodiacs, which means you can maximise your time on shore. From four dedicated sea level launching platforms, transfers are quicker, safer and enable you to get closer to the action for a longer period of time. Just remember to charge your camera before you step onto the Zodiac! Activity options From kayaking and skiing to diving and climbing, these are one-in-a-lifetime opportunities that you need to take advantage of. Aboard the Greg Mortimer there is a specially designed launching platform for all activities, a concept overseen by our activity experts. This area also includes individual lockers in the expansive mudroom and rapid drying areas for wetsuits so you can quickly get warm after exploring in the elements! Dining From the moment you step onto the Greg Mortimer, we aim to give you the best hospitality service possible. Starting with the official Captain's welcome, as our guests, you're welcome to 24 hours complimentary coffee, tea and snack facilities in addition to the range of different menu options and courses for each meal. Meals are served in large dining room/restaurant with family style dining, perfect to swap stories with your new expedition family. Enjoy the range of house wine, beers and soft drinks included with dinner after a long day in the wild, preparing yourself for another exciting day to follow. On the last day of your trip, the team on the Greg Mortimer put on a special farewell four-course dinner and cocktails – a perfect way to reflect on your time on the ship and consolidate lifelong friendships with the people you've met on-board. On-board entertainment When you’re relaxing during a sea day or you have a little downtime on the ship between excursions, what is there to do onboard the Greg Mortimer? Plenty! On all our expeditions, there are experts who lead presentations in the spacious lecture room so you can understand the region a little better. These often include topics as broad as history and culture to biology and climate change, these presentations aim to educate and entertain. If you're keen to just watch the surroundings and keep your eyes peeled for wildlife, you have access to two bars/lounges where the stunning floor to ceiling windows offer a special perspective on the landscape. The Greg Mortimer is also decked out with other facilities for your enjoyment. 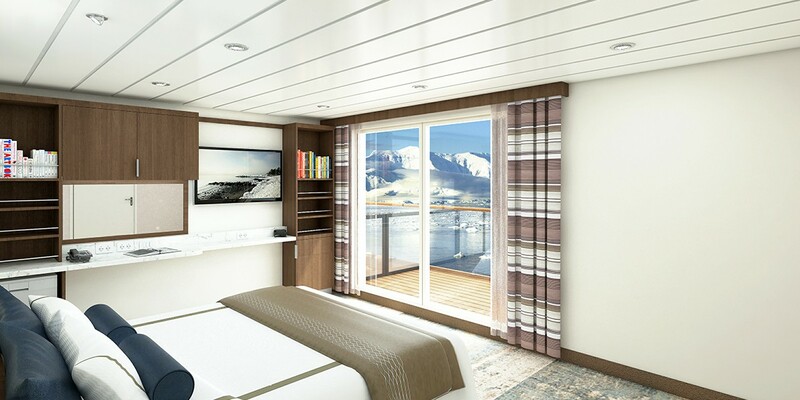 There is a library on Deck 5 with books and maps and a Wellness Centre complete with gym equipment, sauna and spa. Feeling a little sore after walking around all day? Treat yourself to a massage at the Wellness Centre and feels the aches disappear! Keen photographers and artists will revel in the multimedia room on Deck 5.